Critical power derived from a 3-min all-out test predicts 16.1-km road time-trial performance. Black MI, Durant J, Jones AM, Vanhatalo A.
a Sport and Health Sciences, College of Life and Environmental Sciences , University of Exeter , Exeter , UK. 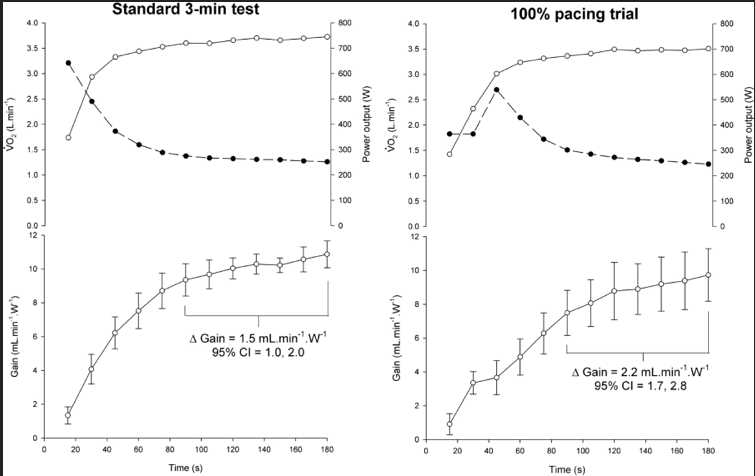 Abstract It has been shown that the critical power (CP) in cycling estimated using a novel 3-min all-out protocol is reliable and closely matches the CP derived from conventional procedures. The purpose of this study was to assess the predictive validity of the all-out test CP estimate. We hypothesised that the all-out test CP would be significantly correlated with 16.1-km road time-trial (TT) performance and more strongly correlated with performance than the gas exchange threshold (GET), respiratory compensation point (RCP) and [Formula: see text]O2 max. Ten club-level malecyclists (mean±SD: age 33.8±8.2 y, body mass 73.8±4.3 kg, [Formula: see text]O2 max 60±4 ml·kg-1·min-1) performed a 10-mile road TT, a ramp incremental test to exhaustion, and two 3-min all-out tests, the first of which served as familiarisation. The 16.1-km TT performance (27.1±1.2 min) was significantly correlated with the CP (309±34 W; r=-0.83, P<0.01) and total work done during the all-out test (70.9±6.5 kJ; r=-0.86, P<0.01), the ramp incremental test peak power (433±30 W; r=-0.75, P<0.05) and the RCP (315±29 W; r=-0.68, P<0.05), but not with GET (151±32 W; r=-0.21) or the [Formula: see text]O2 max (4.41±0.25 L·min-1; r=-0.60). These data provide evidence for the predictive validity and practical performance relevance of the 3-min all-out test. The 3-min all-out test CP may represent a useful addition to the battery of tests employed by applied sport physiologists or coaches to track fitness and predict performance in atheletes. This entry was posted in Reviews and tagged 3 min all out test, Cycling Endurance exercise engineering Fatigue Profiling Heart Rate Monthly Testing Protocol Orthostatic Heart Rates Power sports and exercise engineering sports engineering Sports Exercise Engineerin. Bookmark the permalink.